Welcome to the wonderful and crazy world of operating systems! In the previous tutorial, we have defined what an operating system is. An operating system provides the basic interface between the user and the computer system. It provides the basic look and feel for the system. We have also taken a look at alot of tools that will help us. Assemblers, Compliers, Linkers, PartCopy, MagicISO, and Bochs. For anyone who has no programming experence who is reading this (I know there is some) shame on you :) Please go back and reread the "Prerequisites" section from the first tutorial. Why are you still reading me? Go go go! In this article, we are going to look at operating systems in a different way. We will first go Back in Time(tm) to look at the history of operating systems. You will find there are many similarities between these operating systems. These similarities will then be classified into the basic things operating systems have in common--and the building blocks for your own. Most of todays operating systems are graphical. These graphical user interfaces (GUI), however, provide a large abstraction layer to what is really going on in an OS. Alot of the concepts about operating systems date back sinse programs were on tape. Alot of these concepts still remain active today. Prior to the 1950s, all programs were on punch cards. These punch cards represented a form of instructions, which would control every faucet of the computer hardware. Each peice of software would have full control of the system. Most of the time, the software would be completely different with each other. Even the versions of a program. The problem was that each program was completely different. They had to be simply because they had to be always rewritten from scratch. There was no common support for the software, so the software had to communicate directly with the hardware. This also made portability and compatibility impossible. During the realm of Mainframe computers, creating code libraries became more feasable. While it did fix some problems, such as two versions of software being completely different, each software still had full control of hardware. If new hardware came out, the software will not work. If the software crashed, it would need to be debugged using light switches from a control panel. The idea of an interface between hardware and programs came during the Mainframe era. By having an abstraction layer to the hardware, programs will no longer need to have full control, but instead they all would use a single common interface to the hardware. The first real operating system recorded, according to Wikipedia, is the GM-NAA I/O. The SHARE Operating System was a successor of the GM-NAA I/O. SHARE provided sharing programs, managed buffers, and was the first OS to allow the execution of programs written in Assembly Language. 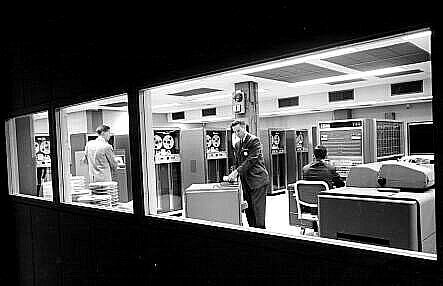 SHARE became the standard OS for IBM computers in the late 1950s. The SHARE Operating System (SOS) was the first OS to manage buffers, provide program sharing, and allow execution of assembly language programs. "Managing Buffers" relate to a form of "Managing Memory". "Program Sharing" relates to using libraries from different programs. Because this isnt the history of the world (nor computers) that I am describing, lets jump now ahead to good old DOS. DOS/360 (or just "DOS") was a Disk Operating System was originally announced by IBM to be released on the last day of 1964. Do to some problems, IBM was forced to ship DOS/360 with 3 versions, each released June 1966. DOS/360 - 16KB Configuation with disk. TOS/360 - 16KB Configuation with tape. A couple of important things to note is that DOS/360 offered no Multitasking, and no Memory Protection. The OS/360 was being developed about the same time by IBM. The OS/360 used "OS/MFT" (Multiple Fixed Transactions) to support multiple programs, with a Fixed Base Address. With OS/MVT (Multiple Varable Transaction), it can support varies program sizes. Now we have a few more interesting words--Multitasking, Memory Protection, and Fixed Base Address. Adding to before, we also have Program execution and Memory Management. The Unix Operating System was originally written in C. Both C and Unix were originally created by AT&T. Unix and C were freely distributed to government and acedimic institutions, causing it to be ported to a wider varity of machine families then any other OS. Unix is a multiuser, Multitasking Operating System. Unix includes a Kernel, File System and a Command Shell. There are alot of Graphical User Interfaces (GUI) that uses the Command Shell to interact with the OS, and provide a much friendler and nicer look. Commodore DOS (CBM DOS) was used with Commodore's 8 bit computers. Unlike the other computers before or since-which booted from disk into the systems memory at startup, CBM DOS executed internally within the drive-internal ROM chips, and was executed by an MOS 6502 CPU. The first Windows was a DOS application. Its "MSDOS Executive" program allows the running of a program. None of the "Windows" could overlap, however, so each "window" was displayed side to side. It was not very popular. The second version of Windows was still a DOS Graphical Shell, but supported overlapping windows, and more colors. However, do to the limitation of DOS, it was not widley used. Note: DOS is a 16 bit operating system. During this timeframe, DOS had to refrence memory through Linear Addressing, and disks through LBA (Linear Block Addressing). Because the x86 platform is backward compatible, When the PC boots it is in 16 bit mode (Real Mode), and still has LBA. More on this later. Do to 16 bit mode limitations, DOS could not access more then 1 MB of memory. This is solved, today, by enabling the 20th address line through the Keyboard Controller. We will go over this later. Because of this 1 MB limitation, Windows was far to slow, which was one primary reason of it being unpopular. Windows 2.0 was completely redesigned. Windows 3.0 was still a DOS Graphical Shell, however it included A "DOS Extender" to allow access to 16 MB of memory, over the 1 MB limit of DOS. It is supports multitasking with DOS programs. This is the Windows that made Microsoft big. It supportes resizable windows, and movable windows. I have seen quite a few beginning OS developers want to develope the next Windows. While it is possible, it is extremily difficault, and is impossible with a one person team. Take a look at the above picture again. Remember that it is a graphical shell over a command shell, being executed by a Kernel. Also, remember that even Windows had to start here. The Command Shell was DOS. the Graphical Shell was "Windows". Looking back though our small trip to memory lane brings some important new terms with it. So far, we only gave "operating system" a small definition. The previous section should help us in defining a better, more descriptive definition of what an operating system is. Thats alot to think about, huh? And yet--The above list is techincally still an abstraction layer itself. Lets take a look closer, shall we? A "Base Address" is the location where a program is loaded in memory. In normal applications programming, you wouldnt normally need this. In OS Development, however, you do. A "Fixed" Base Address simply means that the program will always have the same base address each time it is loaded in memory. Two example programs are the BIOS and the Bootloader. Ability of multiple users to work on the computer. Switching between users without loss or curruption of data. In OS Development, there is no such thing as a "file". Everything could be pure binary code (from the bootsector); from the start. A File System is simply a specification that describes information reguarding files. In most cases, this referrs to Clusters, Segments, segment address, root directories, etc. the OS has to find the exact starting address of the file in order to load it. We will be using FAT12 and be discussing it in detail later. A Command Shell sits ontop the Kernel as a seperate program. The Command Shell provides basic input and output through the use of typing commands. The Command Shell uses the Kernel to help with this, and complete low level tasks. The Graphical User Interface (GUI) simply refers to the graphical interface and interactions between the Graphical Shell and the user. The Graphical Shell provides video routines and low level graphical abilities. It normally will be executed by the Command Shell. (As in Windows 1.0,2.0, and 3.0). Useually this is automatic these days, however. The above code seems harmless. However, if the above code was found in a bootloader, the above code will overwrite itself by 10 bytes. Ouch. The reason is that bootloaders are loaded with a Fixed address of 0x7c00:0, and the above code starts writing from 07bffh: One byte before 07c00h. The bootloader. We seen this term from the previous tutorial. From the previous tutorial, we know the bootloader is loaded by the BIOS, and is the very first program to execute for your operaing system. The bootloader is loaded by the BIOS at absolute address 0x7c00:0. After loading, CS:IP is set to your bootloader, and the bootloader takes full control. A Floppy Sector is only 512 bytes in size. Remember that the bootloader has to fit in a single bootsector. What does this mean? The bootloader is very limited in size, and cannot exceed 512 bytes. Most of the time, the bootloader will either just load and execute the kernel, or a Second Stage Bootloader. We will take a closer look at the booting process very soon. That is when we will look at bootloaders. We have taken a look into the past, and learned a few more terms to our list. After the history lesson, we took the terms and built a more broader perspective on how everything works. We even got to see some code. A small amount, though. After all of this, one should be able to develope a more concise definition of what we are doing. "An interactive envirement that provides an interface for the user and supplied programs, providing a stable and safe envirement, an interface layer to System services and computer hardware." Yep. Thats my new definition of "Operating System", what is yours? In the next tutorial, we are going to take a look on the booting process in descrete detail. Afterwords, we will take a look at building and assembling of a real bootloader.